In this recipe, you will learn how to tune the advanced settings in order get the best results possible with 3DF Zephyr. 3DF Zephyr is a powerful yet simple tool: we put a lot of effort in making it automatic and user friendly, however, this advanced guide will significantly improve both your workflow (i.e. by enabling you to save processing time) and the final result (i.e. getting a more accurate mesh). The default settings will work for most cases, but you can always get a better result. Different settings in each phase can have a huge impact in the phase itself and its following phases as well. Keep this in mind: if a phase result looks good, there’s a good chance the following one will be good as well. However, if you’re having odd results in a phase, you might want to tinker with the settings and re-run the phase before going further down the pipeline. We will now go through each phase and understand what can be changed to achieve better results. This guide focuses on the advanced settings.For a the custom/XML parameters guide, follow this link. When presented with the “new project” wizard, you have the chance to change the behaviour on each one of these sub steps. 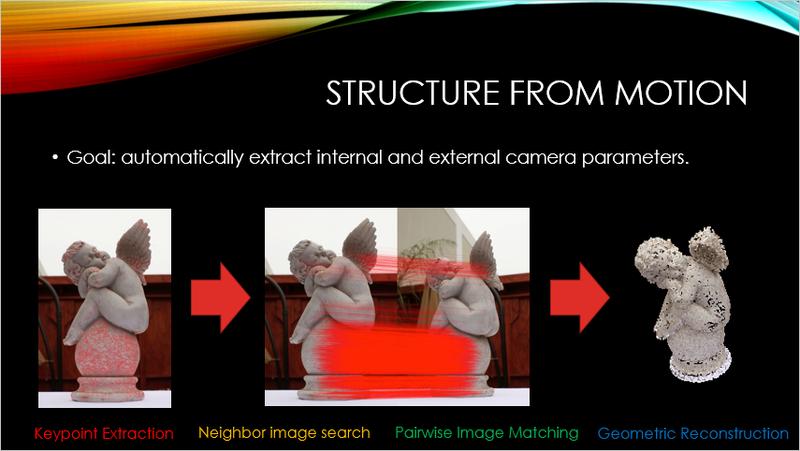 As you can see, the structure from motion phase will first extract the feature of each image (keypoint extraction); after that, Zephyr will go through the images to understand for each image which other images are connected via overlapping (neighbor image search). Once that is done, Zephyr will need to understand, for each point in each image, where these points are located in other images: when all this is done, the actual geometric reconstruction can begin. We can operate on each one of these steps for the best result possible. Controls which optimizations (if any) should be used when computing matches between images. Increase or decrease accordingly depending on the desired accuracy versus speed. 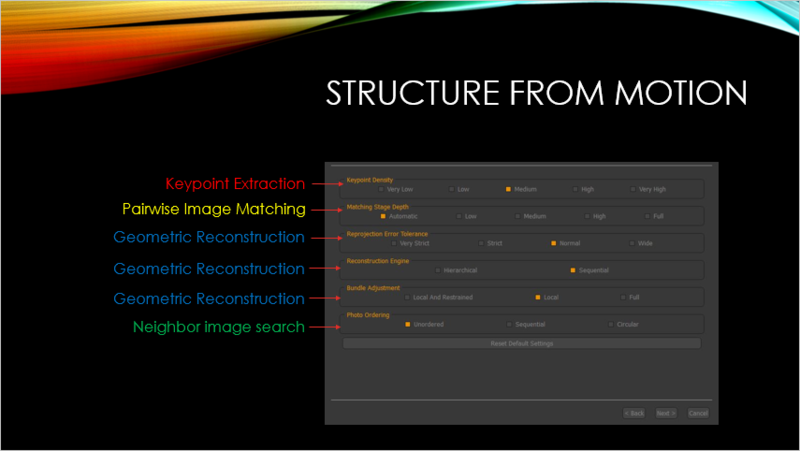 Controls how many pairwise image matching to perform. Usually, the more is the better, however, this comes at a computational cost. If you know the photo ordering, you can skip the neighbor search phase (improving speed and accuracy). If you don’t know the photo ordering, pick “unordered“. However, if you took the pictures in a sequence or in a circular motion pick respectively “sequential” or “circular” (the circular sequence is intended as a closed loop sequence). The “Approximate grid” assumes neighbors in a certain limited set. You can tell Zephyr how cameras have to be reconstructed. With sequential, cameras are reconstructed one by one, growing a cluster of cameras, while if you pick global, cameras are reconstructed in 1 single step. The global pipeline scales very well when there are a lot of cameras and in some cases can help with “drifting” errors. Nevertheless, the incremental pipeline can sometimes guarantee a lower level of discarded cameras in some cases. When enabled, a robust method will be used for discarding far points during bounding box computation. When disabled, all the sparse points will be used. 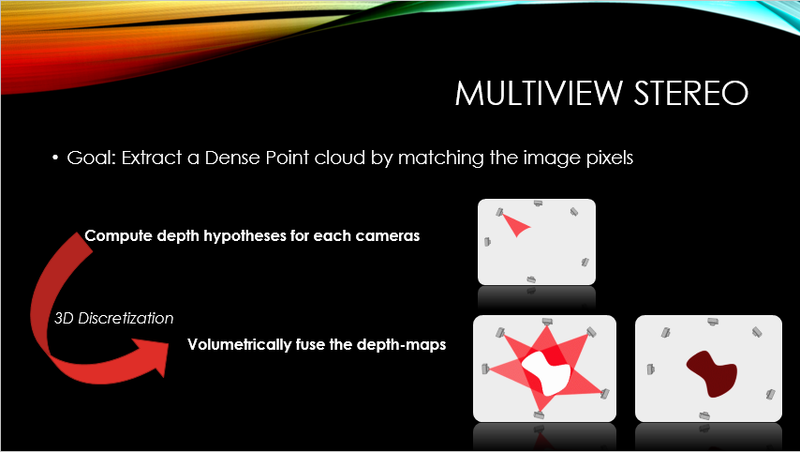 The goal of the multiview stereo phase is to extract a dense point cloud by matching the image pixels. As you already understood, this is what is happening during the “dense point cloud generation” phase. It’s important that what we input to each phase is a good starting point. If you think that the output from the structure from motion phase can be improved, you might want to change the settings and try again. This come both with picture shooting experience and 3DF Zephyr experience. After a while, you will understand which parameters you should change to get better results in each phase! »» You want an output with less holes and denser points. Resolution Controls the input image resolution. Eg, if the input image is shot at 4000×3000 pixels, if the resolution is set to 50% images are then rescaled to 2000×1500 pixels for processing. As you probably already imagined, this next tuning step is about the surface generation (the mesh extraction from the dense point cloud). We can tune the surface generation by acting on parameters of the surface generation algorithm itself and on the parameters required in the post processing step. Photoconsistency based optimization Controls the photoconsistency based mesh optimization parameters. Make sure to check the photoconsistency tutorial for more information on the photoconsistency parameters. Both these procedures share similar parameters (as it is an Inverse mapping from 3D to image pixel) and are driven by the desired size of the ortophoto/texture. Since the color information for each pixel comes from different sources/cameras you can always specify the maximum number of cameras used for the computation. Color balancing is automatically computed but if you’re unhappy with the results you can control its strenght. You can eventually enable the experimental weighting feature, which allows to weight more sharp part of the images vs blurred part of the images (blurriness weight) or the photoconsistency weight (which can be useful when there are moving objects in the scene, for example cars from aerial datasets). This guide should have given you enough insights on how 3DF Zephyr works under the hood. Feel free to use the forum to ask further questions if you need clarification!